The ailerons control the airplane's movement about its longitudinal axis. There are two ailerons, one at the trailing edge of each wing, near the wingtips. 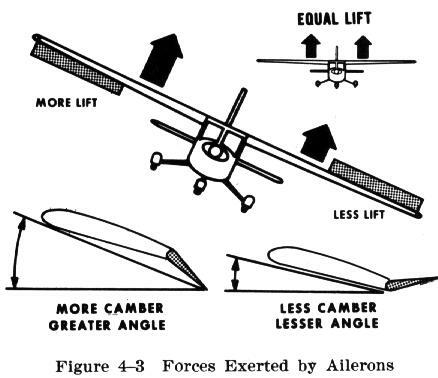 They are movable surfaces hinged to the wing's rear spar and are linked together by cables or rods so that when one aileron is deflected down, the opposite aileron moves up (Fig. 4-2). Contrary to popular belief, the lift on the wings is the force that turns the airplane in flight - not the rudder. To obtain the horizontal component of lift required to pull the airplane in the desired direction of turn, the wings must be banked in that direction. When the pilot applies pressure to the left on the control stick or turns the control wheel toward the left, the right aileron surface deflects downward and the left aileron deflects upward. The force exerted by the airflow on the deflected surfaces raises the right wing and lowers the left wing (Fig. 4-3). This happens because the downward deflection of the right aileron changes the wing camber and increases the angle of attack and lift on that wing. 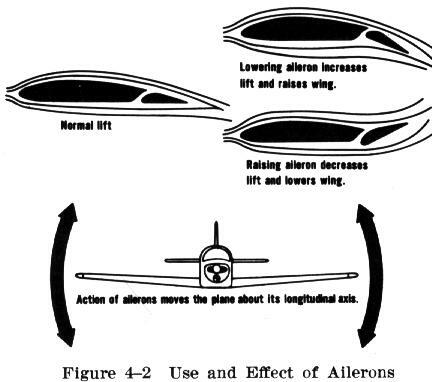 Simultaneously, the left aileron moves upward and changes the effective camber, resulting in a decreased angle of attack, and less lift. Thus, decreased lift on the left wing and increased lift on the right wing causes the airplane to roll and bank to the left. Since the downward deflected aileron produces more lift, it also produces more drag, while the opposite aileron has less lift and less drag. This added drag attempts to pull or veer the airplane's nose in the direction of the raised wing; that is, it tries to turn the airplane in the direction opposite to that desired (Fig. 4-4). This undesired veering is referred to as adverse yaw. To demonstrate this in flight, an attempt can be made to turn to the right without using the rudder pedals. As right aileron pressure is applied, the airplane rolls into a right bank and tries to turn to the right. 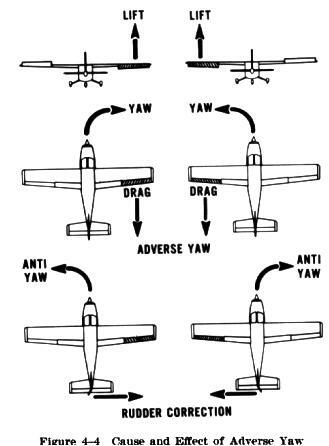 But the adverse yaw, or the drag on the downward deflected left aileron, pulls the airplane's nose to the left. The airplane banks, but it turns hesitantly and sideslips. This is undesirable and corrective action should be taken by applying right rudder pressure. When right rudder pressure is applied simultaneously with right aileron pressure, it keeps the airplane from yawing opposite to the desired direction of turn. In fact, the rudder must be used because the ailerons were used. Therefore, neither of those controls should be used separately when making normal turns. To minimize this undesirable effect (adverse yaw), many airplanes are designed with differential type ailerons or Frise type ailerons.